Salmon patties were another standard in my house while we were growing up. Sadly, when we got married, Peter wasn’t such a fan. But they are such a great way to get some good fish oils into kids, and they are also great because they are the perfect finger food for little hands and super transportable for picnics and lunchboxes. So I have worked at adapting them and increasingly their nutritional value and now they are a resounding success with everyone in our family. Yay! Peel and dice the potatoes. Place into a saucepan of boiling water and cook until soft. Drain and rinse the chic peas, the soak them in boiling water for about 10 minutes minutes, before draining again and mashing well. Grate the zucchini then squeeze out all the liquid between paper towels (might take a few lots of towels). Set aside. Drain the salmon and remove any large bones before mashing together with the zucchini. Roughly sash the potato, then mix through the chick peas, followed by the salmon and zucchini. Add in the dill, salt and pepper then mix. Fold in the corn kernels here if you’re using them. Add in the nutritional yeast and flax meal and mix well until evenly combined. Add in half of the bread crumbs and mix well until combined – if the mixture is still too wet, then add in more of the breadcrumbs until you get a consistency that allows you to form balls. Place mixture in the fridge for an hour (this allows the flax to swell and work better as a binder). Remove from fridge and form in to patties (roll in some breadcrumbs or almond meal if you like more of a crispy coating), then place in a hot frying pan with some oil. Cook until golden and then turn. About 3 minutes on each side. (You can also spray them with a little oil and bake in a preheated moderate oven for about 20 minutes per side). Drain on some kitchen paper; allow to cool a little and then serve, on their own, in a burger or with some extra salad or veggies. These don’t freeze well, but they last a few days in the fridge and are great for easy, healthy lunches. 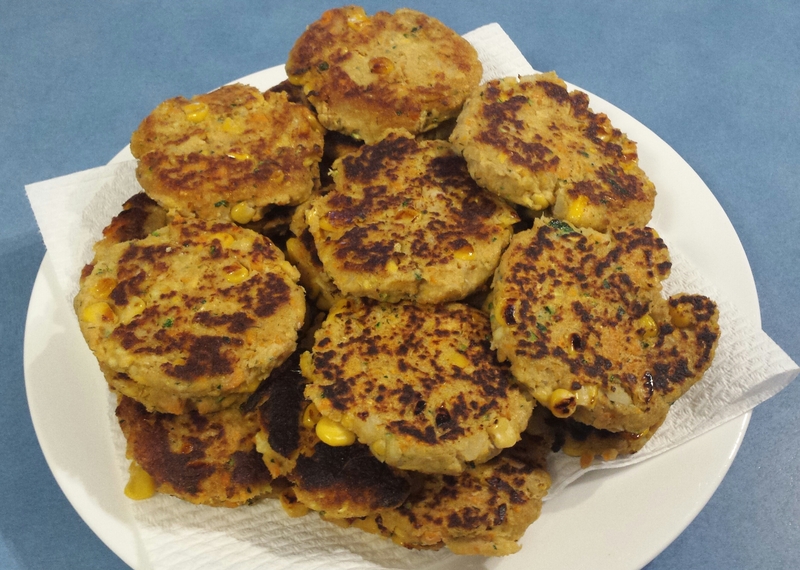 **To make these into veggie patties which as great vegan option we simply leave out the salmon. The work brilliantly on their own or in a burger.